Alaska GOP Sen. Lisa Murkowski is in danger of losing to Tea Party candidate and Sarah Palin-backed candidate Joe Miller. Challenger Joe Miller says there's a bipartisan crisis of leadership in D.C.
(CNN) -- After a night rife with primaries in the far-flung four corners of the United States, plus one in the nation's breadbasket, one race in the far Northwest is still up for grabs. 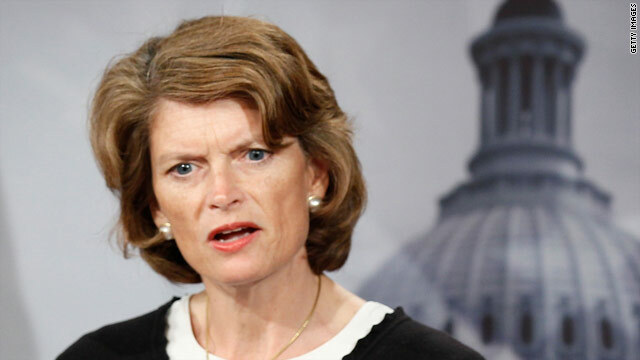 In Alaska, incumbent Sen. Lisa Murkowski is trailing a political unknown. Joe Miller, who has the support of the Tea Party and former Gov. Sarah Palin, is leading by 51 percent to 49 percent, according to election tabulations. The numbers, which show Miller clinging to a less-than-2,000-vote lead, are based on a count of roughly 86 percent of the total expected vote. With as many as 16,000 absentee ballots expected to be received over the next couple of weeks, the contest is not likely to be resolved quickly. Among Tuesday's big winners was Arizona GOP Sen. John McCain, who fought off former congressman J.D. Hayworth. Down in Florida, Democratic Rep. Kendrick Meek's organizational support trumped political newcomer Jeff Greene's billion-dollar bank account in a hard-fought Senate primary. Miller -- on the cusp of one of the biggest upsets of the year so far -- said on CNN's "American Morning" Wednesday that high-profile endorsements helped his campaign, which reflects "one central concern, and that is the out-of-control nature of D.C."
"Bankruptcy is crashing down on this country," Miller said. "Unless we end that entitlement mentality, no level of seniority is going to save us from that." Miller added the problem is a result of a bipartisan "crisis of leadership." Alaska voters also went to the polls Tuesday to pick their gubernatorial nominees. Gov. Sean Parnell, who replaced Palin when she resigned last year, faced two challengers in the GOP primary. With 86 percent of the expected vote in, Parnell had almost 50 percent of the vote, according to the unofficial election count. His nearest challenger, Bill Walker, had 34 percent. On the Democratic side, Ethan Berkowitz led with 49 percent of the vote, while Hollis French had 39 percent. In the southeastern corner of the country, two wealthy candidates in Florida spent a lot of their own money on campaigns. Rick Scott's investment paid off. Greene's didn't. Scott, a millionaire political newcomer, defeated state Attorney General Bill McCollum in the Republican primary for governor, CNN projected. Scott spent $50 million of his fortune since joining the race in April. He claimed victory in front of supporters and alluded to the divisive nature of his fight against McCollum, the party-establishment favorite and former congressman. "Some of you may have noticed this was a hard-fought race. We talked a lot about our differences, but tonight it's time to remember those things that bring us together -- to recall our core beliefs and recommit ourselves to fighting for our principles," Scott said. "The Republican Party will come together, and the reason we will come together is our shared devotion to the values that make America great." Scott was ahead of McCollum, 47 percent to 43 percent, with 92 percent of precincts reporting, according to election tabulations. Scott will face a November general election against Alex Sink, Florida's chief financial officer, who CNN projected will win the state's Democratic primary for governor. In a different race featuring a political veteran against a self-funded candidate with deep pockets, Meek declared victory over Greene in Florida's Democratic primary for U.S. Senate. Meek led Greene 56 percent to 32 percent, with 78 percent of precincts reporting, according to election tabulations. Meek will take on Marco Rubio -- who CNN projected will win the Republican primary for Senate -- and Gov. Charlie Crist, a Republican turned independent, in the general election. Rubio has cast himself as the outsider in the race, painting Crist and Meek as "two people who support the direction that Washington is taking our country." He said on CNN's "American Morning" on Wednesday that "Washington's agenda is destructive for America's future." "I'm very proud of my association with the Tea Party," Rubio said. "But people misunderstand what the Tea Party movement is in America. It is not a centralized organization or a political party. It's the sentiment of everyday Americans who think that Washington has it wrong -- they're taking our country in the wrong direction. And they are looking for voices in American politics that will stand up to that and offer a clear alternative." In northern Florida's 2nd Congressional District, Blue Dog Democrat Allen Boyd faced a tough challenge from his left from Al Lawson. The Associated Press projects that Boyd won that race by a slim margin. Meanwhile, in the Southwest, Hayworth conceded the GOP Senate primary Tuesday night in Arizona after a bitter campaign against McCain. McCain -- seeking a fifth term as senator -- was ahead, 59 percent to 30 percent, with 50 percent of precincts reporting, according to election tabulations. The race between McCain -- the 2008 GOP presidential nominee -- and conservative talk show host Hayworth started off nasty and didn't get any friendlier down the home stretch. McCain spent $20 million to fight off the intraparty challenge, unusual for a four-term incumbent. McCain is expected to easily beat any of the four Democratic primary candidates in the solidly red state. A 10-way Republican primary in the Arizona 3rd Congressional District race to replace retiring Rep. John Shadegg has attracted national attention because Ben Quayle, son of former Vice President Dan Quayle, is one of the candidates. The Associated Press projected that Quayle has won the primary. Quayle would face Democrat Jon Hulburd in the fall in the heavily red district. In the Northeast, longtime Republican Gov. Jim Douglas is retiring in Vermont, giving Democrats hope of competing for the seat. Five Democrats are running in what is considered a tight race. With 89 percent of the precincts reporting, four of those candidates each have more than 20 percent of the vote. The winner will face GOP Lt. Gov. Brian Dubie. In Oklahoma, two U.S. House Republican nominations were decided in runoff elections. Charles Thompson and James Lankford trounced their opponents Tuesday night. In Thompson's 2nd District, Republicans think they have a chance for a pickup this fall against conservative Democrat Dan Boren. Lankford will likely replace Rep. Mary Fallin, who's running for governor. CNN's Peter Hamby, Steve Brusk, Rachel Streitfeld, Jeff Simon and Mark Preston contributed to this report.